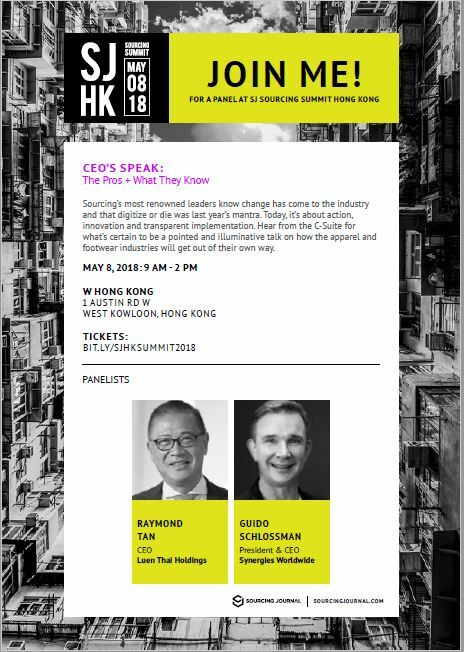 Synergies Worldwide President and CEO Guido Schlossmann is one of the panels for this year’s SJ Sourcing Summit in Hong Kong on May 8, 2018 from 9AM to 2PM. If you happen to be there, join and learn about the latest trends in sourcing industry specifically on innovation, taking action and transparent implementation, in this interesting and challenging era of Digitalization. Sourcing’s most renowned leaders know change has come to the industry and that digitize or die was last year’s mantra. Today, it’s about action, innovation and transparent implementation. Hear from the C-Suite for what’s certain to be a pointed and illuminative talk on how the apparel and footwear industries will get out of their own way.